Force High-Definition (HD) Playback on YouTube Embed? A WordPress YouTube Embed Plugin to help you easily customize a video, playlist, channel, gallery, or live stream. Forcing High-Definition (HD) Playback on a YouTube Embed? One of the more common support requests we get from our WordPress users relates to how they can use our YouTube plugin » to guarantee that their video embeds always play in high-definition (HD). It’s not particularly surprising since site owners generally want to present their sites in the best light. What could look better than the highest definition quality, one might ask. It turns out, however, that there are other highly important factors to consider during playback that might require high picture definition to take a back seat. The same kind of link could be used as the link in a standard YouTube embed code to get HD playback on a given site. Furthermore, there were different quality levels besides 1080p; i.e., 240p, 360p, 480p, and 720p. Regardless of this flexibility, most embedders will choose the maximum definition (1080p) for reasons already mentioned. This reasoning, however, does not factor in the connection of the individual visitors’ machines and the resource costs on YouTube servers. A visitor on a mobile device with a slow connection might not care to see a funny cat video in its highest definition if it means significant waiting. Along these lines, it would not be an efficient use of YouTube’s servers to spend computation time delivering the highest quality HD video to devices that are unable to effectively handle content. Note that, the above rules are just defaults that can be overridden by viewer settings. That is, registered YouTube users can set their own HD preferences when viewing (not embedding) a video. The settings are active when logged in. If you have a YouTube account, you can see your own settings by simply logging into YouTube and going to your Account Settings. 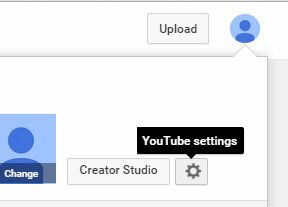 To find the settings, click the the user profile icon on the top right of the YouTube homepage and then click the gear icon in the box that pops up (see image below). From the settings page, click on the Playback menu options and pick your desired effect (as shown below). You might have to restart your browser for the changes to kick in. Learn more about how to embed YouTube videos and galleries in WordPress here » and learn more about our premium embedding options and analytics here ».